Originating in India, and traditionally passed down through families, a good scalp massage is the perfect way to finish off your spa session. It offers complete relaxation, with the soothing, repetitive motion easing your brain gently into a natural resting state. It’s no coincidence that this is the state in which many people have their best ideas – it’s why inspiration often strikes, somewhat inconveniently, just as you’re falling asleep at the end of a long day! With a portable head massager, you can get your brain into that ideas-rich resting state any time you like, in the comfort of your own home, whilst watching your favorite movie, or just chilling out in a comfy armchair. These products come in a range of styles, designs, and functionalities, and, to help you make the best choice, we’ve selected a few of the top picks from across the board. The DCI Rainbow is a simple, basic product, featuring an array of metal tines, plastic-tipped for comfort, and presented in bright, fun rainbow colors, which makes this an ideal tool for a child’s first experience of unfettered tingles. While some have suggested the DCI could do with being a little larger for genuine functionality, its small, lightweight design makes it ideal to toss in a purse or travel bag, so you know you have the option of a quick, basic scalp rub on the go, or when you’re staying away from home. The DCI offers a perfect, simple, easy-to-use introduction to the pleasures of a scalp massage, without the expense of a spa or salon visit. 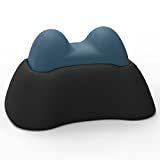 If you just want simple and portable for a quick once-over now and again, the Happy Company traditional scalp massager should bring a smile to your face! A simple wooden ball construction, with a cheery, smiley face painted on the center grip, the Happy Company is fun, simple, and basic, although the wooden balls can be a little harsh on the scalp, particularly if you have sensitive skin. The construction is solid, however, and these things really do last. Moving from simple relaxation to a model that is designed to offer relief for tension headaches, there’s the Essential Tension. Tension headaches are the bane of many peoples’ lives, with the pain often getting in the way of both work and leisure activities, as well as being unpleasant to experience. The Essential Tension comes in a range of four colors, so you can choose the design that most appeals to you – colors range from a deep teal to a sand-swept beige, so there really will be something to suit everyone. Portable yet solidly built, the Essential Tension is a two-piece unit – a base and a top cushion – that might be better (and a little more practical to use) as a single piece item. Some people find it somewhat uncomfortable – we say that while it does require a high pain threshold, if you regularly experience tension headaches you probably already have that pain tolerance, and you’ll welcome any relief. Next, we have the iHausPlus, which features fully customizable percussion action, in an ergonomic design. 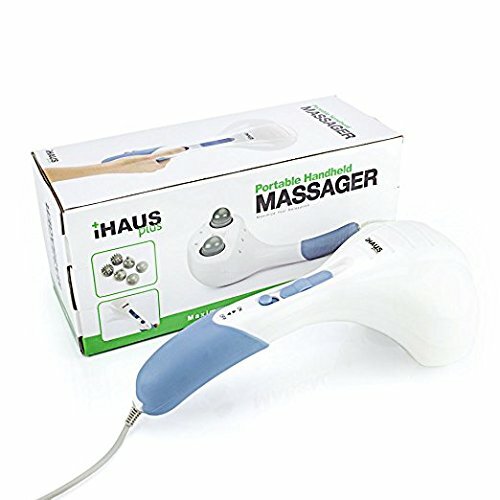 The iHausPlus’ heavy duty electric motor can transmit up to 3,350 pulses per second, giving you a really thorough, deep massage. The iHausPlus can be used over the whole body, not just as a cranial massage tool, and some people have observed that it particularly helps with the pain associated with fibromyalgia – as with any home medical treatment, however simple, do make sure to discuss the use of the iHausPlus with your physician if you are considering purchasing it to help with conditions such as fibromyalgia. Jane found the iHausPlus a little too powerful for her, and Philip agreed it was a little harsh to use on the skull, but as an all-round unit that you sometimes use up top, he thought enough people would like it to include it in this list. The Oster Stim-U-Lax offers contemporary functionality in a sleek retro design, housed in an attractive chrome shell, designed with ergonomics firmly in mind, and continuing a brand with a decades-long tradition of stylish success. 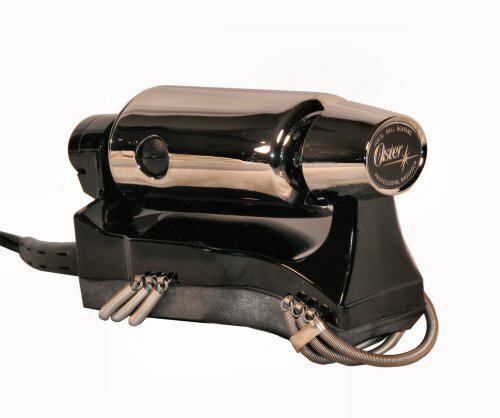 It has been used by barber shops and massage therapists for years – a motor and spring make the unit move up and down giving you thousands of massage movements per minute. Check the bliss on the model’s face in this video if you’re in any doubt about its efficacy! The main drawback with the Oster is that the power switch is placed in such a way that it can catch the side of your crown as you are using it. You have to pay close attention to your technique to stop it turning itself off, which interferes somewhat with the idea of a massage being about total relaxation! It’s a minor quibble, though. 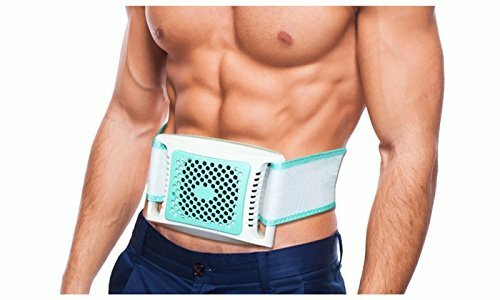 It’s also a little heavy, which is easily resolved by having someone else use the Stim-U-Lax on you – which massively adds to the overall experience in any case! If you do have someone willing to use this on you, it’s an absolutely stellar purchase you’ll never regret. Like many traditional wellness treatments, head massage, and massage in general, isn’t just a feel-good luxury. Scalp massage, particularly, has shown some observable benefits for stroke patients, and massage in general puts both body and brain in a perfect state for future work, whether physically or intellectually driven. Skullcap massage is known to be helpful for the natural relief of headaches, and, while massage for pain relief is usually done with the fingers, to enable more subtle manipulation, the smaller, more lightweight options could equally fulfill this role, and be a useful aid for those who may not be able to apply the necessary amount of pressure through their finger tips. It is quite common for airport lounges to offer these treatments as an optional extra – with the associated extra cost – so, if you’re a frequent flyer, you could save yourself a few bucks by purchasing a travel-weight head massager to take with you on your trips.